Hopefully these links work so you can have a look at it! Let me know if it doesn't! WoW, that's different, erm, it's only a guess but with a Wing series neck, and a wrap round bridge it looks to be Japanese, but it could have been made on the cuff of a factory change, and the builders put together what they had in stock at the time. There are a few of this sort of build going round, which is what got this thread going in the first place, nobody knows for sure, and it could have been put together either by Matsumoku or Yamaki. It looks a real nice guitar, and the older models just seem to have a quality about them which (IMHO) can put much higher priced models to shame. Anyway wish I could be of more help, recommend (if you haven't already) that you read the thread from the start. It gives you an idea of the fun we're having trying to find out about this era of Washburns history. Mate thanks so much for checking it out, yeah it's an absolute ripper to play!! So nice, and easy to slide up and down the frets with some great action and a bright amazing sound to it that rivals most guiitars I've payed!! I've had a look through this thread and at the start one of guys posted up a flyer of a few of the washburns and in that flyer is my HB35, I think they said the flyer was from 1989 so I I'm guessing that it's from that time frame but without a serial number it's hard to guess what it's actual date is, also a bit strange that it doesn't have one, but what you've pointed out about them changing factories makes a bit more sense. So really appreciate you checking it out for me, it's been a really good read through this thread!! If anyone else can help us shed anymore light on my model it would be great. Hay Raudlem- I have a HB35 identical to yours with the same problem- no serial #. Don't feel alone. 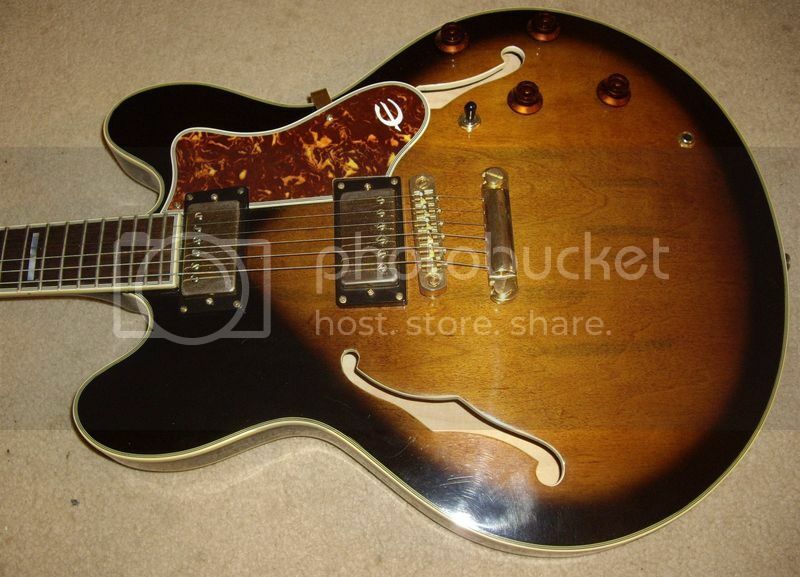 Here's a question - if there is no serial number does the guitar exist ? I'm guessing that these hybrids are late 1980's. First things first. The first generation of the HB35 looks to have an almost identical bridge to the Daion Headhunter and it is the same string through design. The serial numbers also match in style and design. These would have been build on the Yamaki factory. In early 84 when Daion went under we suspect that it took the Yamaki factory with it. In the next couple of years after that Chushin was building instruments with 4 digit serial numbers. They also build for Terada. At some point between 84-88 everything from Yamaki got sold to Korea. We know this part because the Daion brand continues to be sold from Korea after 84. We suspected that it was Samick that bought everything (including parts, brand, blueprints, and machinery) so this is a confirmation that it very well could be. The serial number style is the same from Yamaki to Samick - which means that the SN machine from Yamaki could have been sold to Samick. They also build instruments very very similar to the Yamaki line. Add that to the mix that they did indeed sell the Daion instruments its is a very very very good chance that Samick build the HP35 after 88 or so. Anybody able to confirm this with facts? TK maybe? 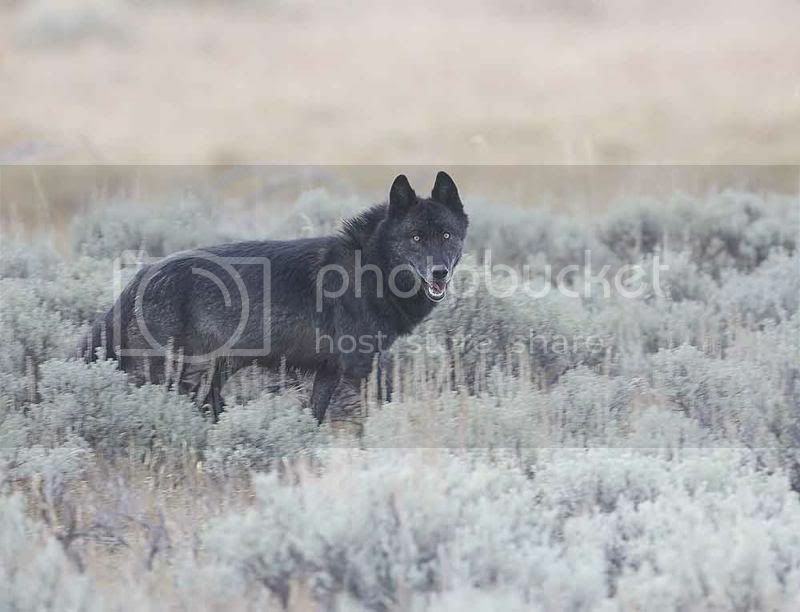 Hi, I ran across this thread and thought I could offer some info. I've been researching Samicks and from what I know, I'm fairly certain the HB-35s you're talking about were made in Korea by Samick. The biggest clue is the extra wide bridge that is only found on Samick products. 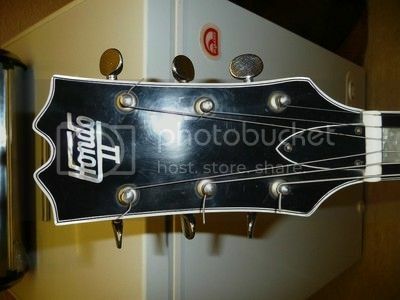 Also, the Schaller-style tuners with the brand name ink-stamped on the back; classic Samick trademark. Then there's the headstock shape; strikingly similar to the shape used by Samick, first on Hondos, later on their own Artist Series. The only quirk is the four digit serial number. Typically, Samick would use a seven-digit serial, although around 1990 they were pretty inconsistent as they were changing to a new code. I haven't gone through the whole thread so I didn't see any pictures of the serial numbers. Where are they and are they ink stamped, stickers, etc? 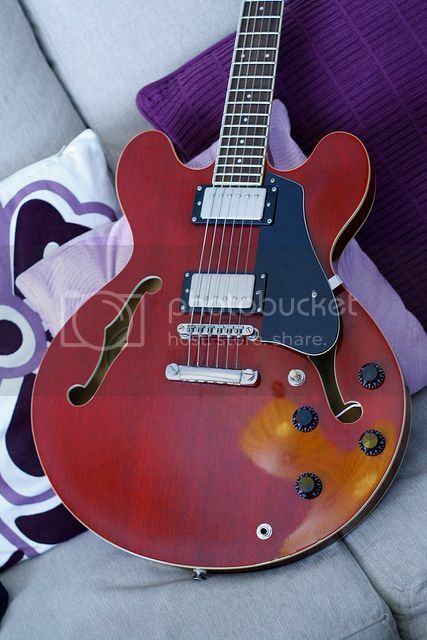 This one (the red HB35) as well is probably made by Samick, based on the bridge, oversized pickguard and triangular TRC. 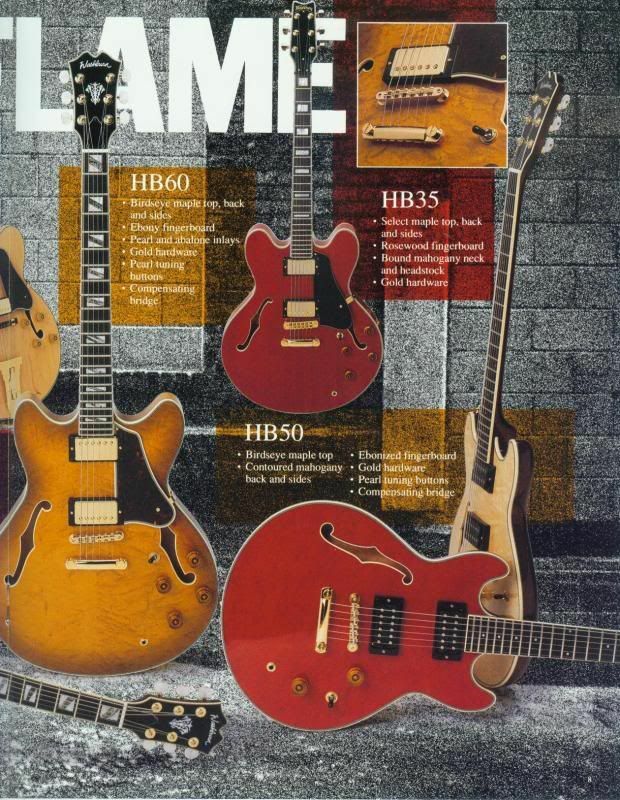 Samicks (especially from the '80s) are often mistaken for Japanese guitars because of the build quality, and their semihollow models are considered some of their best work. I own an Artist Series 335 copy and it doesn't disappoint, even next to my Custom Shop Gibson. I'll keep reading through the thread and see what else I can find. So this has the Samick trademark bridge, pickguard and TRC. The pyramid volute is something I know Samick has done before (in fact, the model I've seen it on was made in 1989 as well). Ahh, now I see the serial from that one (had to open the picture in a new tab). So it's ink stamped on the inside label. A common style, but also very common for Samick. Typically, the first number is the last number of the year. So say, 8552 would be a 1988. 552 could be the production number. Although Samick made tens of thousands of guitars a month, this could have been a more limited run (thus warranting the unique serial number). I would have assumed the four digits were all a production number if they didn't all seem to start with an 8. This one here is indeed a 1990. It's very common that the ink stamped serials would fade, or were just very lightly stamped to begin with. I'm guessing the owner write down the rest of the number before it faded entirely. Oh, I almost forgot, the tuners being badly aligned was common with Samicks as well, and I see that on these models. I have never seen a HB35V either. Some of the long time members might have seen one. How long have you had your 82. Would love to see some pics of all three together, when your third one arrives. I hope you grow to like the cream color,so you won't be tempted to do a color change. Great Guitar. 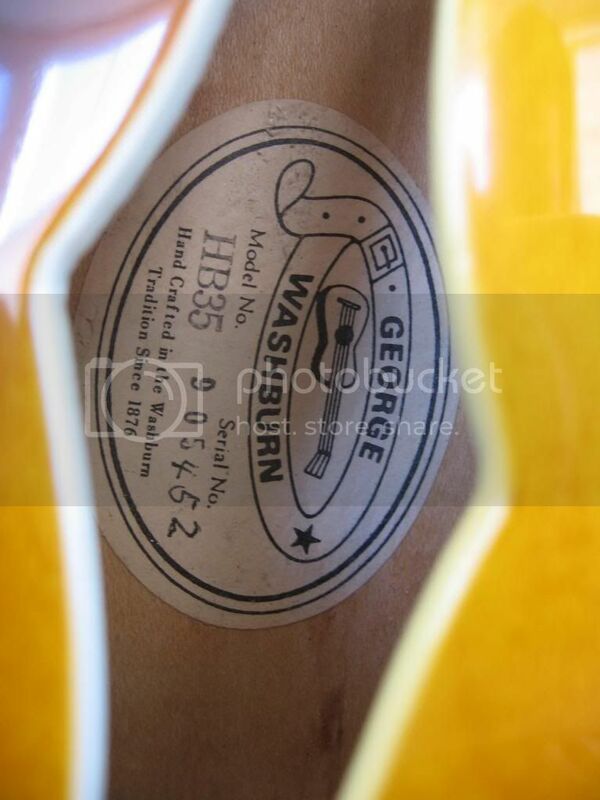 I looked on google and found a Washburn ad I had seen before and didn't look closely at. Has the vibrato model. Also found this ad in Switzerland. I saw the 82 the night it was posted on ebay in early January and got sidetracked. Got on ebay the next morning and you had already bought it. Is the incoming one from Florida? I'm glad you got it. I got sidetracked and as you know, you can't get them all. The ones in Florida were more than I wanted to spend and the one at Sam Ash was a little rough. I really would like to find the DL model. One will show up eventually. Yep, A lot of the Washburns from the 80s have great quality for the price. I just started looking for a DL in the last couple of months. There were two in Europe, one for $450 and the other for $800. Some sold in the US last year between $500 to $700. The one in Florida is much more than most would pay. Hi, Sorry to see you removed your posts. I was looking forward to seeing the Family photos. Thanks for posting the pics. The twins are gorgeous and the cream looks great since you cleaned it up. I hope you have decided to not paint the cream. Thanks For posting. I saw it last night and decided to pass.